This is the first blusher that I have purchased to add to my MAC Pro Blush Palette. A couple of months ago, I was struggling with my OCD and it hit a whole new level. I was unhappy with everything and as I looked in my makeup draws, it affected me to a point where I made an irrational decision to throw everything in the bin, including all of my blushers. I don’t really know what it was, I think I was tired of having hundreds of compacts in no particular order. So, from that I thought the best thing to do would be to create a MAC Palette and select 6 shades that work the best for me, that I can reach for time and time again, so I don’t end up with a collection that is out of control. For each of the shades that I am going to buy for this palette I am going to make sure I really look into them and even try to go into a store before I commit and spend my money. I want to make sure that all of the shades are easy and wearable, so that I get lots of use out of them and to make sure that none of them are going to be a waste of money for me. So, after a long time looking online and even going into my local MAC store and having a play around with the shades, I finally decided that the first shade that I add to my palette should be one of their most popular shades which is Frankly Scarlett. The reason why I went for the shade Franky Scarlett is because it shows up really well on my skin. I have an olive complexion and I think that the pink of this blusher seems to work really well with my natural colouring. I find that quite often, hell of a lot of blushers are too light for my complexion, or they do not end up showing true to the shade that is in the pan. I had a play around with this one and I looked at some swatches online with people with various skin tones and I couldn’t deny that this was the most stunning shade and I felt like it was a really great place to start. What I love about his blusher and MAC Blushes in particular is how beautiful they glide onto the skin and how easy they are to blend. Even if I went in and applied far too much of a MAC Blusher, I know that all I would have to do is take a clean MAC 187 Duo Fibre Brush and with some light blending, it quickly looks lovely on the skin and merges into the skin absolutely beautifully. 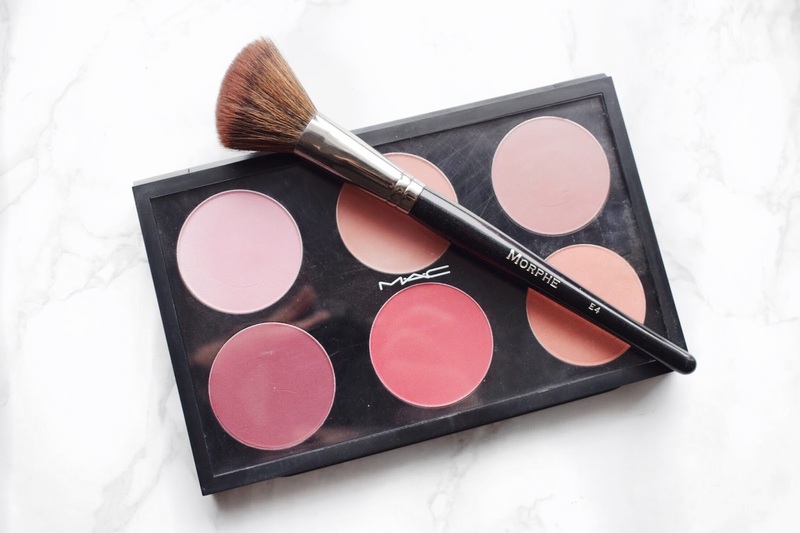 I have tried a couple different MAC Blushes over the years and I feel like this has been the case with all of them, and that is one of the main reasons why I decided to create a palette dedicated to MAC. This MAC Frankly Scarlet Blush is so lovely and creamy, and I think that is what makes it so nice and workable on the skin. I like to apply this blusher by taking a small amount on an angled brush like the Morphe E4 and I will apply it directly to the apples of my cheeks, then using circular motions I will blend it back along my cheekbones and it just makes it looks nice and natural. Once, I have my blusher on my face, like I said earlier I will take a clean blending brush and just buff over the whole area to make sure that it all blends into the skin beautifully and seamlessly. There really isn’t much more that I can say about an individual blusher, so I will start to round up my blog post. I think that this is a great product and I love reaching for it. It blends into the skin like a dream and it has the perfect level of pigmentation. I am so happy that I started out with this Frankly Scarlett shade and I cannot wait to buy some more and build up my collection. I will leave a link down below to this blusher in case you want to check it out for yourself. Make sure to leave me a comment down below and let me know what your favourite blusher is and I will have to check it out for myself! This shade is gorgeous, it reminds me of Bobbi Brown Apricot which is one of my faves! I love it, especially now when I am yearning for the summer! Me too, plus it blends out so nicely!